iProfit eBook Package - Affiliate Directories: Announce Your Affiliate Program! So if you're ready to stop wasting precious hours and elbow grease searching for sites & directories where you can list your affiliate program, place your order now! P.S. : No need to worry about not being satisfied because you are covered with my 30 day unconditional money back guarantee! If you aren't satisfied, simply let me know and I will refund 100% of your investment! No questions asked. P.P.S. : Remember you also receive master rights and website to sell from - FREE with your purchase today. P.P.P.S.: . 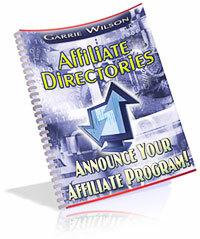 Attract more people to sell your products and services for you with your own copy of Affiliate Directories. Get started earning more income today!